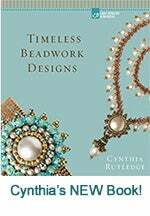 This book is the result of my inspiration to design and bead, using as my muse famous paintings dating from the late 1400s to the early 1900s. Each of the 15 brand new designs in this book uses multiple techniques and beautiful materials to create a timeless style of jewelry that never goes out of fashion. Elegant earrings, necklaces, bracelets, and a brooch make up this collection of work. Each design has two color ways (one has three) to give you a lot of options when either working from my color palettes or striving to design your own. The jewelry designs in this book are there to inspire you to bead with passion. Finding what inspires you to create is a glorious experience, and it is my honor to be able to share a bit of my process with you. Blessed are we who see so much delight in these little beads, for what is done with love is done well. Each book sold here is personally autographed by Cynthia.